Hans von Salmuth came from a Prussian military family. He served as a soldier during the First World War and had reached the rank of captain when the war ended. In 1934 he was promoted to colonel and in 1938 he became Chief of Staff for the Second Army. He was promoted to major-general on 1 August 1939. He participated in the German attacks on Poland and France and he took part in the Battle of Sebastopol. In August 1943 he was put in charge of the 15th army near Calais. But the allies attacked in Normandy and in August 1944 he was replaced by Gustav-Adolf von Zanger and received no further commands during the war. After the war he was imprisoned until 1948 when he was tried in a military tribunal in Nuremberg. He was found guilty of war crimes and crimes against humanity and sentenced to twenty years in prison. In 1951 his sentence was reduced to twelve years and he was released in 1953. He died in Heidelberg in 1962. 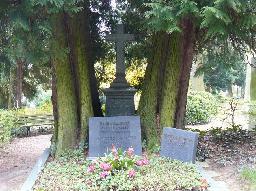 The grave of Hans von Salmuth at the Nordfriedhof, Wiesbaden.